Marlborough, Mass. - Tuesday night’s matchup between the St. John’s (Shrewsbury) Pioneers and the Marlborough Panthers featured two teams trying to reach milestones. Marlborough star senior Chris Doherty was looking for his 1,000 career point, and St. John’s head coach Bob Foley, who is already the winningest coach in the history of New England boys high school basketball, was vying for his 900th victory. Only one of those achievements was reached on Tuesday night, however, as Doherty scored his 1,000th point early in the fourth quarter to help the Panthers hold off the Pioneers, 65-64, at Marlborough high school. Marlborough (8-2) has made a habit of losing big leads late in games, and Tuesday’s contest was no different. The Panthers, who led 32-27 at halftime, opened the third quarter on a 21-3 run. The only points for the Pioneers (7-5) over that span came courtesy of a corner 3-pointer from captain Sean Burke, who led all scorers with 29 points, to go along with 7 rebounds and 3 steals. Marlborough head coach Scott Bauman said that defense was key to his team’s success in the first four minutes of the third quarter. Offensively, the run was headlined by a pair of three-pointers from Stephen Digregorio (13 points) and a triple from Alex Santos (16 points). Santos, and said that the Panthers thrive when everyone plays their part. “(Players should) be a star in their role,” Coach Bauman said after the game, adding that Digregorio and Santos had worked hard and played with confidence. The Pioneers did not give up easily, however, as they closed the third frame on a 14-1 run of their own. 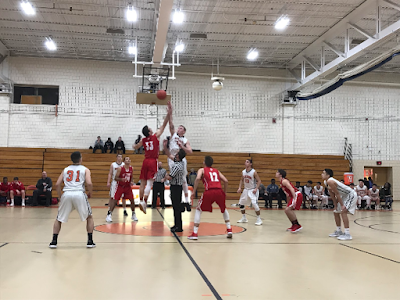 A three-pointer by junior Bobby Duquette, who, along with scoring 9 points, played tough defense on Marlborough’s star guard Kevin Short, cut St. John’s deficit to 54-44 entering the fourth quarter. After Burke hit a floater to make the score 56-48, Doherty scored his 1,000 career point on a rebound and putback. Play was stopped as the milestone was announced, and Doherty received a standing ovation from all in attendance. While Doherty was excited that he reached the 1,000-point mark, he also showed that he puts his team ahead of personal accolades, and wished the game wasn’t stopped to acknowledge the moment. “(Scoring 1,000 points) is something you dream about when you start playing high school basketball,” Doherty said after the game. He added that he “ just wanted to keep playing” after the basket instead of stopping play for recognition of the achievement. Coach Bauman said that Doherty’s desire to continue playing says a lot about his star player’s character. “When (Doherty) scored his 1,000 point, he didn’t want to come over and celebrate. That’s the most selfless… and that’s him to a T. He’s such a competitor,” Bauman said following the game. Once Doherty scored his 1,000 point, the Pioneers continued playing in the hopes of their coach picking up his 900th career victory. A rebound and putback by senior Hunter Gorgas (11 points, 7 rebounds) and an old-fashioned 3-point play by Burke cut Marlborough’s lead to 56-51. A jumper by Short (10 points, 4 steals) and a corner 3-pointer from Santos opened up a 61-53 advantage for the Panthers. The Pioneers responded with a 3-pointer and a layup by freshman Nathan Bangandozou (5 points), cutting their deficit to 61-58, but Santos drove the length of the floor for his own layup to extend Marlborough’s lead to 63-58. Burke and Doherty each made layups before a rebound and putback by Gorgas with 58 seconds left cut Marlborough’s lead to 65-62. St. John’s captain Steven Bucciaglia (7 points, 7 boards) hit two free throws with 16.1 seconds left to make it a one-point game. Short missed the front end of a 1-and-1 with 12.8 seconds remaining, giving the Pioneers the chance to win in dramatic fashion. Jonah Hintz knocked the ball away with 5 seconds left, but Duquette tracked down the ball to give St. John’s one last gasp. The Panthers prevented the Pioneers from getting off a good shot, allowing Marlborough to escape with the victory and sweep the season series against St. John’s. Both Coach Bauman and Doherty said they want to see their team do a better job of maintaining big leads. “We got to learn that when we’ve got a lead, we’ve got to sustain it,” Bauman said following the win. “We’ve got to mature a little bit and figure out how to close games,” Doherty added. While the Panthers have let teams get back into games, they have escaped with victories and are finding ways to win. They hope that will continue on Friday when they travel to Leominster to take on the Blue Devils. St. John’s has to be happy with the way they fought back, cutting a 23-point deficit to just one, and having a chance for a game-winning shot in the final seconds. The Pioneers will try again for Coach Foley’s 900th career win on Friday when they host Sutton.